The actor will voice a Canadian motorcycle stunt rider named Duke Caboom. Toy Story 4 will hit theatres this June, bringing the characters of Woody (Tom Hanks), Buzz (Tim Allen) and Bo Peep (Annie Potts) back together again. This time, however, they've made a new friend, and he's distinctly Canadian. We've known that Keanu Reeves was joining the wildly popular Disney/Pixar franchise, but today the company revealed which character the Canadian actor will be voicing: Duke Caboom. According to the studio, Caboom is a "1970s toy based on Canada's greatest stuntman. Riding his powerful Caboom stunt-cycle, Duke is always prepared to show off his stunt poses with confidence and swagger." While a motorcycle stuntman is certainly a profession close to Reeve's own interests, the character does sound a lot like Buzz Lightyear, at least on paper. It turns out that Reeves recognized this right away and made Caboom more, well, polite. Speaking on the Tonight Show, Tim Allen said, "We calmed him down a little bit." So there you have it — a calmer, gentler, motorcycle-riding Buzz Lightyear, which sounds right up Reeves' alley. 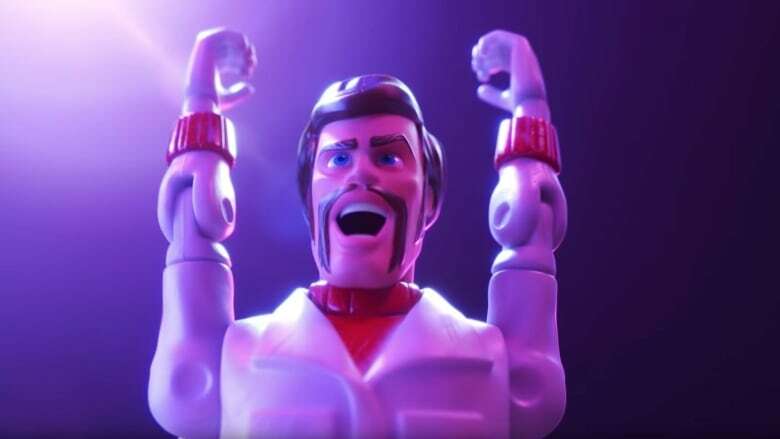 Watch the first full-length trailer for Toy Story 4, which comes out June 21, below.